In 2011 this blog was involved with the Fire Brigades Union in investigating the handing over of London’s and Lincolnshire’s fire engines to a private company called Assetco. The company nearly went bust in 2011 owing £140m. Shareholders and banks hoping to make money from privatising the emergency services lost millions and small shareholders were ruined. The City Hall Tories under Brian Coleman, then the elected chair of London’s fire authority now nowhere in public life, saw the flagship policy as a future blueprint for privatisation. Instead it was a disaster compounded by an Old Etonian baronet buying London’s fire engines for £2 from Assetco only to go bust himself leading to another company taking over. Now six years later the grim and unsavoury truth has come out. A report from proceedings taken by the Financial Reporting Council against the auditors of the Assetco, big accountancy firm, Grant Thornton, and the accountant who audited the company Robert Napper, has led to a £3.7m fine for both of them for professional misconduct. Neither Grant Thornton nor Mr Napper made any financial gain out of the scandal. The facts are staggering. Over two years Grant Thornton were found to have committed no fewer than TWELVE cases of professional misconduct which meant the accounts presented to the public were mainly fictitious. Robert Napper was found to have ELEVEN cases of professional misconduct. An accompanying report reveals the scale of the dishonesty and cover ups. They range from fictitious payments amounting to millions of pounds from City Hall to buying up a firm for a relative with shareholders money and creating a rental firm that let property out to directors. So extensive was the deception that I intend to use further blogs to describe in detail what happened. Grant Thornton also had to pay £200,000 as a contribution to the Executive Counsel’s costs. Mr Napper, an accountant with 23 years experience, was seen to have acted so badly that they have also recommended he be barred for three years from membership of his professional organisation ( the ICAEW –Institute of Chartered Accountants in England and Wales) for breaching their code of ethics. Mr Napper, from South Oxfordshire has since retired. The Executive Counsel of the FRC said: ” The misconduct of Mr Napper , in its totality, is so damaging to the wider public and market confidence in the standards of members and in the accountancy profession and the quality of corporate reporting in the United Kingdom that removal of the member’s professional status is the appropriate outcome in order to protect the public or otherwise safeguard public interest”. Further inquiries by me show Mr Napper in his Linked In page was publicly endorsed by seven people including Perry Burton, head of London audit, for Grant Thornton. and Natasha Pettiford-White, an executive assistant at Grant Thornton. Mr Burton’s recommendation would carry considerable weight as he is an auditor of 20 years experience. Grant Thornton were approached and did not reply. I have written about this in Tribune magazine. In my view this shows that one of our big accountancy firms was derelict in its duty in protecting the public from people who obviously wanted to fleece shareholders and took no care in auditing the books of people in charge of vital emergency vehicles in London and Lincolnshire. It also shows the real dangers of privatisation and we cannot trust big accountancy firms to act in the public as opposed to their private commercial interests. You will see the scale of the scandal in future blogs. The scandal over the privatisation of the vehicles owned by London and Lincolnshire fire brigade is a never ending saga. First the company pulled out of the UK to concentrate on the Middle East and then sold its London assets to a baronet for £2 only to have them taken over by Babcock in an emergency deal by the London Fire Brigade. ( see previous stories on this blog). Now with a new interim report from the firm the real cost to the people who invested in a” couldn’t fail” take over of public assets is revealed in the balance sheet. “The new Board has been considering claims to recover value for shareholders given the very significant decline in value following the four separate fundraisings amounting to £53m between 2009 and 2011 when, from the published accounts it appeared the Group’s financial position was satisfactory. “As explained in the 2011 Annual Report, the massive restatements to the 2009 and 2010 financial accounts and the requirement for a Scheme of Arrangement subsequently showed a very different situation, and the differences arose from the UK businesses. The funds raised between 2009 and 2011 had primarily been utilised in support of an apparently flawed business and financial model associated with the UK vehicle leasing and maintenance business, without any reasonable prospect of shareholder value. His proposed launch of a £50m claim against dismissed chief executive John Shannon and chief financial officer, Frank Flynn, among others who quit, may have little chance of success. As this blog has already reported Shannon is selling his mansion in Northern Ireland and was on the way to be declared bankrupt. Flynn’s fate is not known. But the figures speak for themselves. The accounts reveal that by offloading the company’s UK assets to the baronet, Sir Aubrey Brocklebank, some £84m of losses was averted. 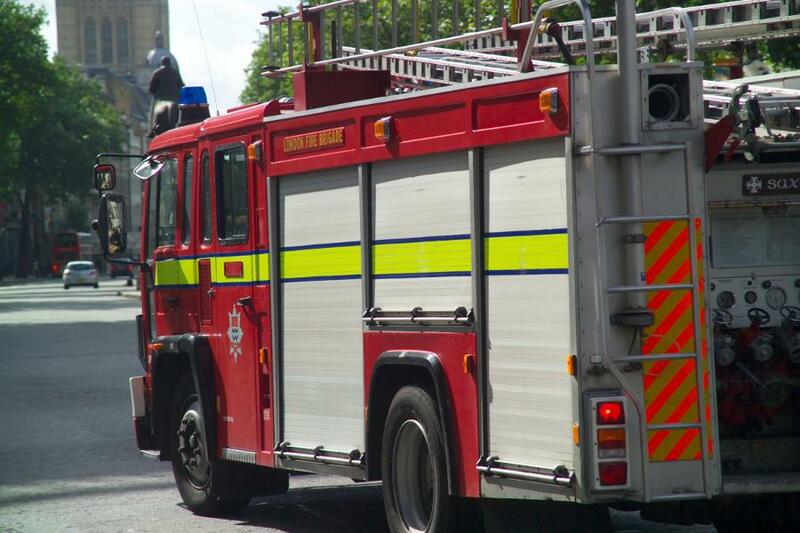 Last August net liabilities were £51m for the two fire brigades and that was after creditors had to settle for a £4.9m payment – losing around 78 per cent of their investments. Shareholders lost virtually all their money – when the shares were reduced to junk statues – some 300 times below their best value. Shares are still trading in the remainder of the company which now is exclusively providing fire services in Abu Dhabi in the United Arab Emirates where it has made a £3m profit. One wonders what Arab Investors would make of the shennaghins in the UK if they knew the full picture. The lesson of this privatisation exercise seems very clear. It was bad for public services in London and Lincolnshire, bad for the banks and other big investors and even bad for the ” get rich quick ” small shareholders who lost most of their cash. Anybody who thought they were going to make a quick buck out of the emergency services should think twice. The incredible scandal surrounding the botched privatisation of London Fire Brigade takes yet another mad twist. Sir Aubrey Brocklebank, the baronet who bought the brigade’s entire fire engine fleet for £2 just three months ago, has had his contract terminated by the London Fire Brigade today. His company has gone into administration only four months afterv it was set up, it was among a string of companies that appear to have been set up by the baronet only to fail. 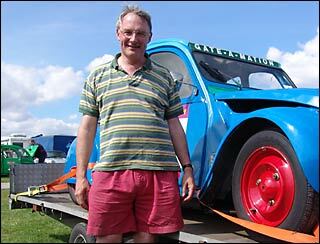 The eccentric baronet who loves to race ageing 2cv’s at racetracks across the UK and lives in a three bed semi in Wellingborough, Northants, thought he could make a fast buck by selling on the company. There is a previous blog which will tell you everything you need to know about him on this site. You the council taxpayers have been paying this man £1.5m a month to look after London’s fleet. He got this at a knock down price because the Greater London Authority foolishly sold off London’s fire engines and a 20 year lease on its own maintenance headquarters in Ruislip to a private firm. The firm was sold on to AssetCo ( which I have written about extensively) whose own chief executive, John Shannon, dismissed by the firm, after he left it teetering on bankruptcy. He is now going bust himself. The engines are at present owned by bankers, Lloyds TSB, one of the chief creditors of AssetCo London which had over £30m in debts and haven’t a penny to replace the ailing fleet of engines from 2014. This has been admitted by Sue Budden, director of finance,of the London Fire and Emergency Planning Authority. She told councillors at a meeting in September: “When they look ahead and look at the big vehicle replacement that is due to start in 2014, I think they can see they are not set up to cover that.” The full story by me is on the Exaro news website at http://www.exaronews.com. Now it emerges surprise, surprise that after a few months that he can’t deliver and the authority has had to use emergency powers to end the contract and has handed it over to Babcock without any tender competition. The interim contract will last next 18 months. London Fire Brigade has appointed Babcock International Group to manage and maintain its fleet of fire engines and specialist equipment on an interim basis. Due to a deterioration of the services provided by Premier Fire Serve Limited (previously called AssetCo London Ltd), the London Fire and Emergency Planning Authority, which runs the Brigade, has exercised its right to terminate the contract and appoint a new provider. While, undertaking a full, competitive procurement of the services, it has appointed Babcock to maintain the fleet on an interim basis of 18 months until the new provider has been appointed. BREAKING NEWS: A Donegal call-centre has gone into administration with the loss of 30 jobs. Workers at the Buncrana-based Assetco Manage Services ROI were told the bad news this afternoon. The company, is part of a larger company, Assetco London Ltd, which works with London Fire Brigade. London Fire Brigade failed to renew a major contract for Assetco London Ltd leaving workers out in the cold. Shell-shocked workers at the company, based at the IDA Business Park in Lisfannon since 2006, were told the news today. Even worse is the fact that none of the workers will be paid redundancies. Ironically most of the London-based employees will be taken on by the company who won the new contract, Babcock. However, the Irish company have not been given part of that new contract and will lose their jobs. Members of KPMG, who are acting on behalf on London banks, turned up at the Buncrana company’s headquarters today to break the news. Angry workers say they are outraged at how they have been treated. A spokesman told Donegal Daily that they are considering their positions and are even thinking of staging sit-in at the plant. “We have been very loyal to Assetco London and this is how we have been rewarded. “We would like London Fire Brigade to know this and to know how we are being treated. “There are 30 families being thrown on the scrapheap just before Christmas it’s just not on,” said a spokesman.